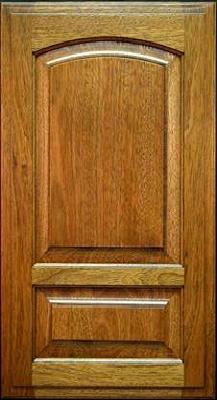 Our fully equipped door shop can make just about any cabinet door style you or your decorator can imagine. Our only requirement is that it be made of some kind of wood. We will not as a matter of policy use any wood that is endangered or threatened but that still leaves a vast selection. Our "standard" woods are Birch, Maple (hard and soft), Red Oak, White Oak, Cherry, Hickory/Pecan and Walnut. We also frequently build in Alder, Poplar, European Beech, Pine, Ash, Lyptus, Red Elm, Mahogany, Douglas Fir, and Butternut. And we have recently added Bamboo. 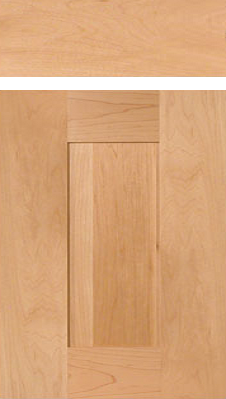 Alder and Poplar are used primarily for painted cabinets since they take paint very well. 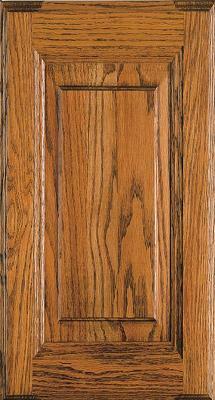 But if you must have Ipe, Rosewood, Chestnut or Catalpa, we can do that. 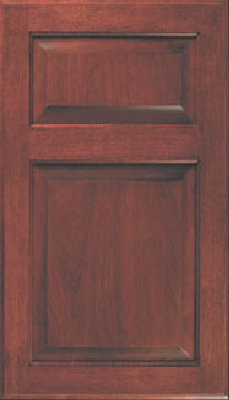 If you don't see the door style you have in mind, send us a picture. We can tell you within 24 hours (excluding weekends and holidays) if we can make it. Our normal finish is a fourteen-step process ending with three coats of clear polyurethane or lacquer. This is an exceptionally durable hand-applied finish that resists just about any chemical and will look new after years of service. However, we also do hand rubbed lacquer, glazes, painted (including milk paint), glazed and distressed finishes. Show us what you want, our finish crew can probably match it. There are two basic kinds of doors: flush (or slab) and framed. 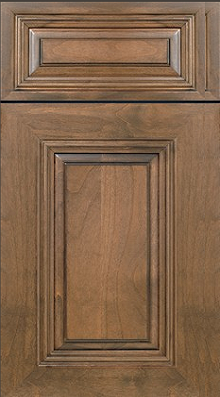 These days a slab door is usually a piece of cabinet-grade plywood with a decorative edging — usually veneer. In former times, they were made of boards pegged together. These tended to warp and twist, so elaborate measures were used to keep them straight, including steel or aluminum T-bars buried in the top and bottom edges. The other style is framed. 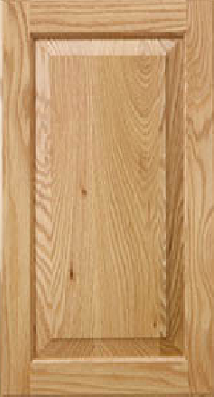 This is a flat or raised panel inserted in a frame of solid lumber. The door parts have names. 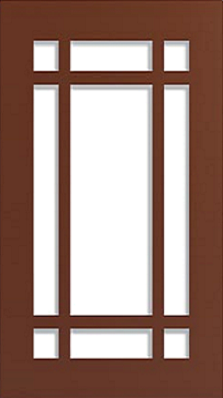 The horizontal pieces at the top and bottom are "rails", and the vertical pieces on both sides are "stiles". There may also be stiles or rails in the middle of the door. These are naturally called "middle stiles" and "middle rails". Styles overlap rails, originally so they could be easily planed down to fit without hitting end grain which is very hard to plane. Nowadays saws cut very accurately and planing is rare. We still follow the traditional technique because, well, it's traditional. 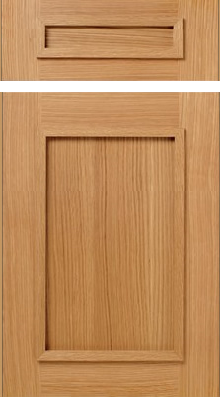 There are also mitered doors on which the corners are cut at a 45 degree angle, just like a picture frame. These are usually considered premium doors. The piece in the middle is the "panel". 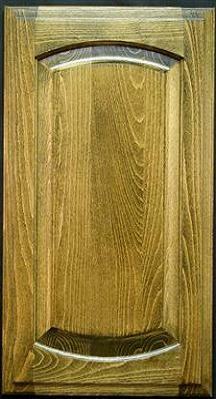 This is usually high-quality plywood but some panels, particularly beaded panels are made of solid wood. 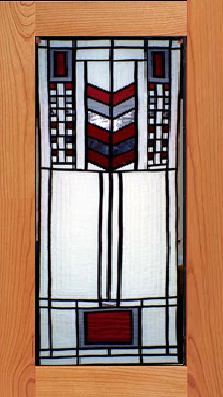 The panel may also be glass, including stained or other art glass, metal, lattice or grillwork. 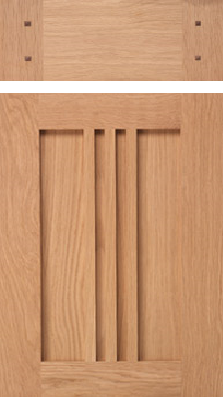 The defining feature of these doors is their simplicity. There is no shaped moulding on any edge. All edges are cut square. 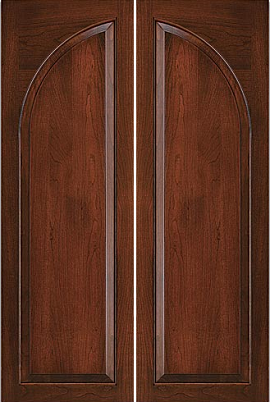 If the edges are moulded, then they are called "flat panel" doors but are not considered Shaker or Arts & Crafts doors but more colonial or traditional styles (see below). If you are wondering what is the difference between Shaker, Mission and Craftsman styles, frankly, so do we. 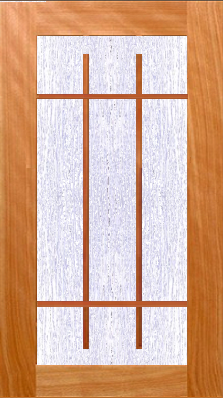 There are certain door styles that are easily identifiable as Craftsman or Prairie because of their gridwork patterns which are adopted from traditional Craftsman or Prairie windows. 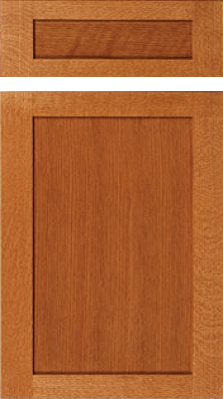 But for plain panel doors, the task of distinguishing between the styles is much more difficult. Any plain, flat panel style that is thought of as a Craftsman style here in the Midwest is likely to be called Shaker or Amish on the East Coast and Mission in California. 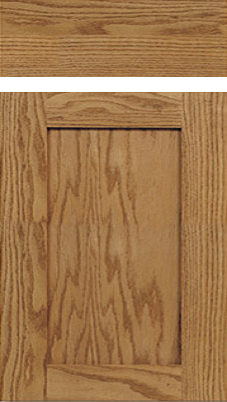 Shaker is traditionally made of maple, and generally a maple door is identified as a Shaker style. 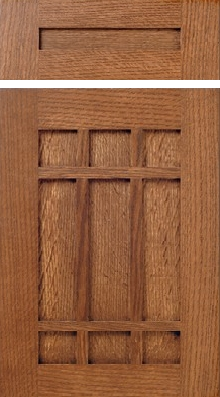 Craftsman or Mission doors are traditionally of of quartersawn oak. 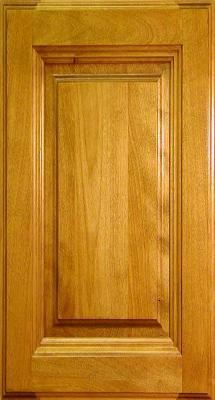 But there are also pine, elm, fir, hickory and painted doors in both Shaker and Craftsman kitchens. So your guess as to these doors is as good as ours. Whatever you think it is: Shaker, Craftsman, Prairie or Mission, we'll go along with it. 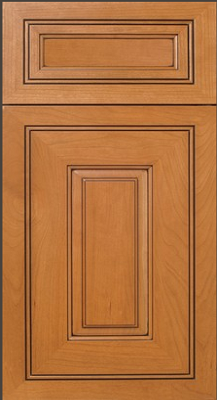 In our shop catalog we have specifications for over 350 styles of Arts & Crafts or Shaker-style doors and drawers. We obviously cannot show them all. The table below displays just a few representative samples. Any one of these styles will work well in an Arts and Crafts kitchen. If you have in mind a door not shown here, send us a picture or drawing. 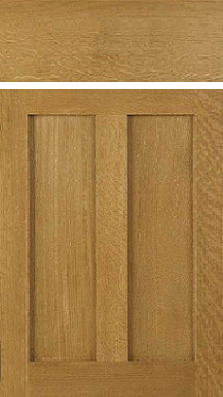 We probably already have a shop specification for it but if not, we'll make one just for your doors. 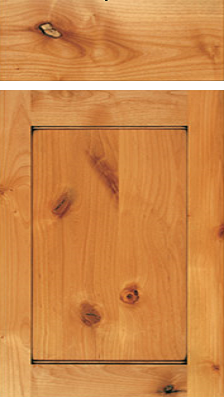 Sealed and Washed knotty pine. Most of Arts & Crafts styles are available with pegged joints. 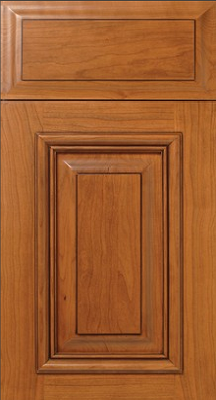 In the days when cabinets were built with hide glue, pegs added substantial additional strength to the door. These days the new synthetic glues are not greatly strengthened by pegs. Nevertheless, our pegged joints are not just simulated with veneer or stain. They are actually pegged through and through for additional strength. Available with round pegs, square pegs and with square and round flush pegs. An inexpensive way to add variety and interest to your cabinets is to mix glass panels in with your wood panel cabinet doors. If you want to display the contents of a cabinet, use clear glass and even add a small light inside the cabinet. 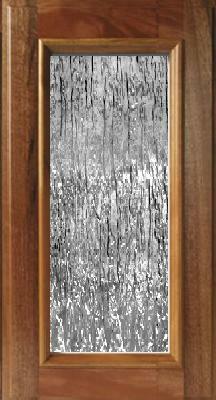 If you like the idea of glass but still want to hide the mess in the cabinet, use textured or stained glass. We provide the framed door suitable for glass, and you have the glass installed locally. For art glass, our artisans can create the glass from your design or you can select one of our stock designs. 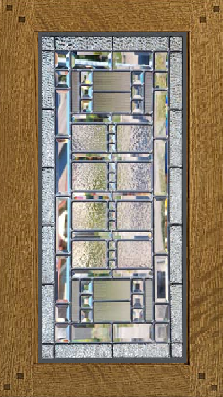 Almost any panel door can be converted to glass, so a glass door to match your craftsman, mission or arts and crafts door selection is virtually guaranteed. We do not recommend glass on lower cabinets. In most jurisdictions such glass would have to be tempered. But, having said that, we have built some beautiful contemporary kitchens with frosted glass in lower cabinets for the ultimate Euro-kitchen look. Unfinished rift cut white oak. 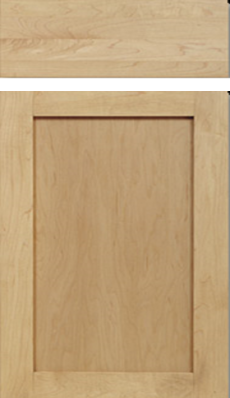 The traditional raised panel door style often associated with colonial or traditional kitchens is actually a modern invention. Colonial kitchens did not have cabinets but they did have doors. 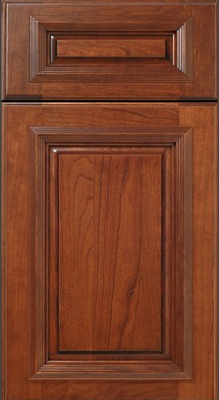 So kitchen cabinet designers simply adopted the raised panel door style of colonial houses to use in cabinet doors. 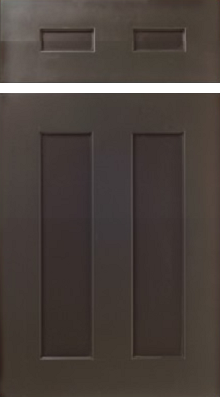 Colonial doors can be painted or stained. 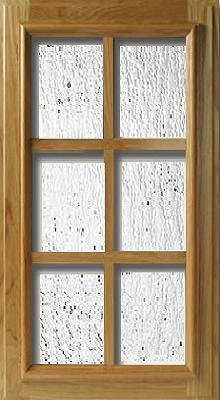 The usual paint in colonial times was milk paint, a surprisingly durable coating comparable to modern paints. It has a matte finish that is very hard to duplicate with modern water or oil based paints. 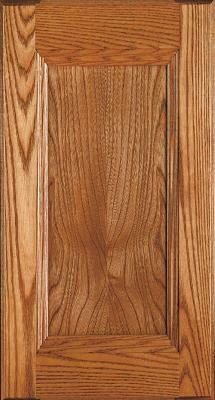 The traditional colonial woods are maple, cherry, red and white oak, walnut, and mahogany. 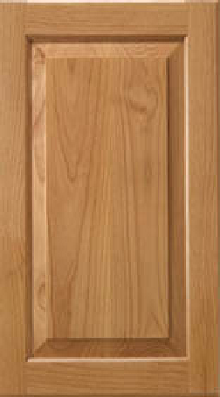 Poplar and alder are often used as a substitute cherry, and elm sometimes replaces oak. Walnut was a premium wood even in colonial times, and still is. 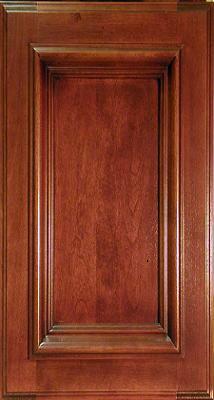 For a Victorian kitchen, the fancier panel doors are usually the choice. These often feature elaborate mouldings and fine finishes. Darker stains are characteristic, although these tend to make a small kitchen look even smaller and probably should not be used. For more of a Victorian County look, beadboard panels are the preference. Usually these are painted. 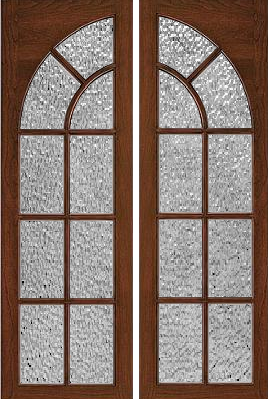 Raised panel doors are made in square top, arched and arched cathedral patterns. 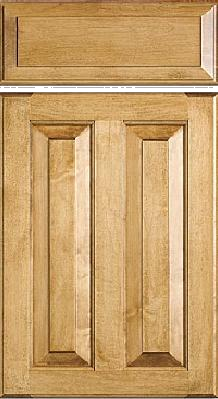 If arched doors are used, they are used on upper cabinets and square tops on on base cabinets. There are not particular rules, though, so you can mix and match arched, cathedral and square tops to create a unique look for your kitchen. 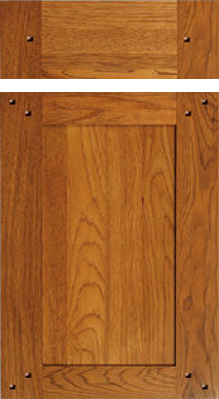 We have in our shop catalog, specifications for over 200 raised and beaded panel doors and drawers. We obviously cannot show them all. The table below displays just a few representative samples. Any one of these styles will work well in an colonial or Victorian kitchen. If you have in mind a door not shown here, send us a picture or drawing. 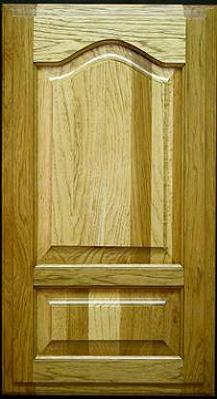 We probably already have a shop specification for it but if not, we'll make one just for your doors. 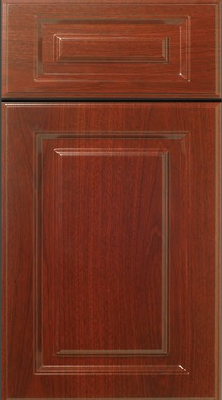 Cherry is usually a premium cabinet wood. It makes beautiful cabinets but sometimes the budget just is not there for the real thing. 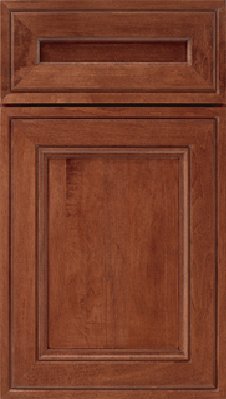 Careful staining and finishing can turn inexpensive alder into a very convincing cherry-look cabinet. 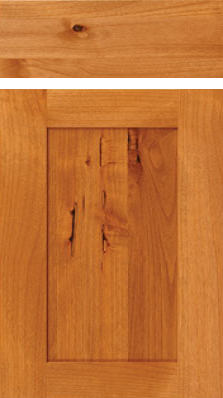 Alder is a standard cabinet wood, and therefore less costly than cherry. Cherry stained birch with glaze. The original colonial paint was milk or casein paint. This is a surprisingly tough and durable paint for interior use. A lot of original milk paint still clings to antique colonial furniture after 250 years. The recipe is simple: milk, lye, linseed oil, salt and pigment. But we don't usually mix it ourselves, we buy it from milk paint companies. In powdered form, it has a very long shelf life as long as it is in an airtight container. But after it's mixed with water, it needs to be used in two days or so. 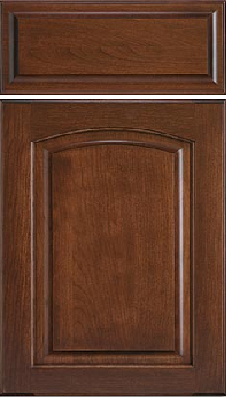 Virtually any colonial cabinet door style can be finished with milk paint for that ultimate in colonial looks. Milk paint even carried over into the early Victorian years, and is wholly appropriate in a Victorian kitchen. 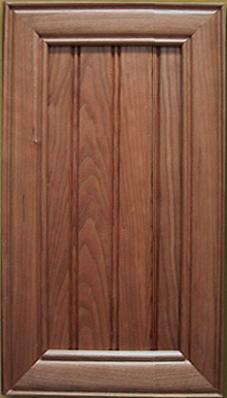 Victorian Wide-Stile Beaded-Frame Panel Door. 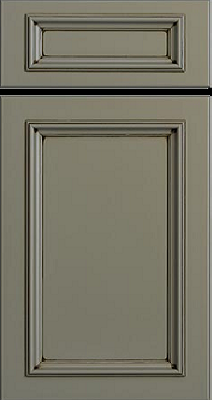 Square Panel with Applied Moulding. These are doors and drawers for special purposes. 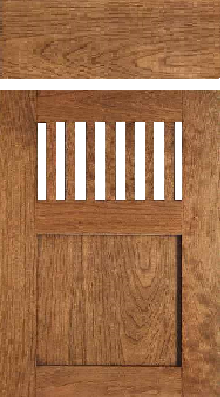 We rarely use louvered doors, for example, except on vanity cabinets in baths. Arch doors are more for furniture. for example, we use French Glass Arch door on a lot of breakfront cabinet in dining rooms but also on built in corner cabinets. 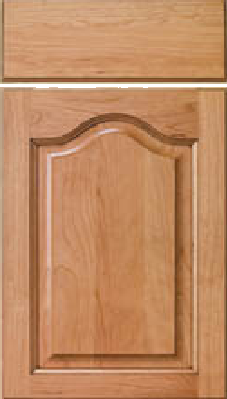 Here are some of the specialty door in our inventory. 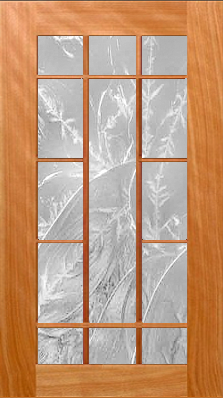 Glass Panel Door with Applied Moulding.